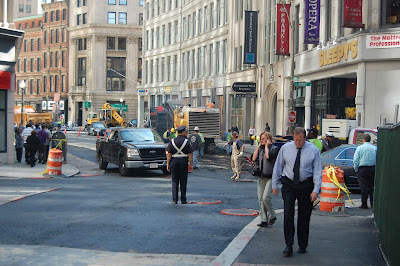 I went out walking at lunchtime today and saw workers paving Franklin Street. I always thought this was done at night so as not to inconvenience traffic, to say nothing of pedestrians. City streets are loud and congested enough without these giant beasts chewing up and spitting out gravel during the day. I know it has to be done, but maybe night time would be better.